I have been revising a list of arguments for the racial hereditarian theory of intelligence. It is a long case, and I decided to devote this thread only to the background knowledge. The background knowledge is relevant for evaluating the "prior probability" of any thesis. If I tell you that I have a dog in my garage, then maybe you don't know my direct evidence to back that claim, but you know it is still far more likely than the claim that I have a monstrous live fire-breathing dragon in my garage, because of our background knowledge of biology (it is more likely that I have a monstrous live fire-breathing wyvern, as a wyvern has four limbs but a dragon has an implausible six limbs). The unfortunate strategy of the anti-racist rhetoric is the targeting of the scientific background knowledge. The activists have waged a war against the evolutionary concept of races, as though it is pseudoscience, and they have waged a war against the whole mainstream science of human intelligence, as though it is pseudoscience. BACKGROUND KNOWLEDGE #1: Intelligence variations among individuals within each group are highly heritable. Maybe you think intelligence is badly defined--but we can keep it simple: intelligence is just the scores on IQ tests--or maybe you think there are things wrong with heritability studies. Regardless of that, it is difficult to explain why identical twins REARED APART have a correlation of IQ of 0.74 (on a scale of 0 to 1), whereas fraternal twins REARED TOGETHER have a correlation of only 0.59, except with the strong effect of genetic variations on intelligence variations. If you don't know what correlations are, then another way of expressing it is that identical twins reared apart tend to have more similar IQs than fraternal twins reared together. For context, fraternal twins share only 50% of their genetic variants, whereas identical twins share 100%. This means intelligence has a within-group heritability of 74%, leaving only 26% to environmental variations within groups. This argument is about within-group heritability, and that does not directly translate to between-group heritability, so don't jump the gun. Unless genetic variations within groups have a much greater effect than you would like to think on intelligence variations within groups, you I expect you can not effectively explain these numbers. I challenge you to explain them in any other way but the effect of varying genetics on varying intelligence. BACKGROUND KNOWLEDGE #2: Races genetically differ. Maybe you think races are badly defined, or maybe they are just social constructs. We can assume both. Let's say we define "white" as, "anyone who self-identifies as white," "black" as "anyone who self-identifies as black," and "Asian" as "anyone who self-identifies as Asian," each within America. If races are defined this way, then a large diverse set of purely genetic large differences exist among those groups. We can start with the externally obvious stuff: skin color, height, natural hair, nose, and eyes. A bunch of us stop there to make sense of human races, but all medical doctors know that races are deeper than the skin. Races significantly differ in bone density, muscle mass, lung size, blood type frequencies, blood pressure, pathogen resistance, adult lactose tolerance, and estrogen level, among many other things. Even purely genetic traits have racial differences: whites are about 5 times as likely as blacks and 10 times as likely as Asians to have cystic fibrosis, for example, and cystic fibrosis is a purely genetic disease. None of these things are universals; a minority of blacks and a minority of Asians are adult lactose tolerant. Not all "blacks" have black skin! But, all it takes to make a racial difference is a difference in frequency or a difference in average of a given trait. Almost nobody thinks absolutes of any sort apply to races, or else they are wrong. In the context of evolutionary biology, "races" are merely subsets of the species with either geographic boundaries or differences in ancestral mating patterns, and they genetically differ from other subsets of the same species. All species that have covered large geographic areas for more than a few generations have races, and humans are no exception. The genetic difference between human races is measurable: an "Fst" (Wright's fixation index) of about 0.12. Some writers have claimed that this value is too low to qualify as biological "races," but this is a myth that started out as apparent lies from two academics (they misrepresented their sources). The biological concept of race is broad, and all it takes is a phenotypic and geographic difference of any sort to qualify. You have heard many arguments against the biological concept of races, i.e. more variation exists within each race than between races (Lewontin's fallacy). The arguments are diverse and complex, but they don't deny the established set of significant genotypic differences that plainly exist among races, even if races are only social constructs, and so those arguments are irrelevant. Such genotypic racial differences apparently exist within every physiological system of the human body. If the nervous system were an exception, then it would be indeed a strange exception. 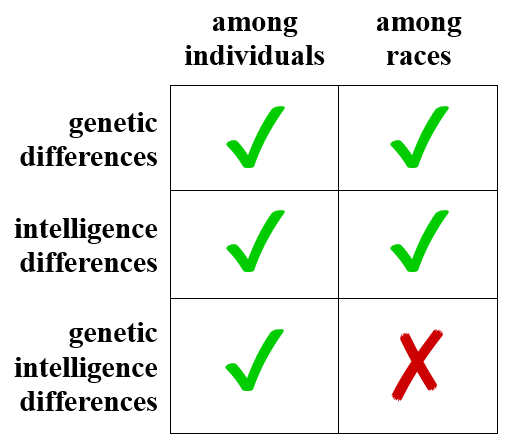 BACKGROUND KNOWLEDGE #3: Races differ in average intelligence. This is NOT the same as saying that races differ in average intelligence due to genetics! This is only saying that races differ in average intelligence. White Americans have an average IQ of 100, black Americans have an average IQ of 85, and Asian Americans have an average IQ of 105. These are facts established by thousands of studies persisting over a hundred years to the present. Even without genetics and without hate, it is a racist thing to say. Say it on Facebook and you may go to Facebook jail (at least that is the way it was when I was on Facebook--the Facebook Terms of Service is a living document). You can get elected to public office after saying it only if you represent Steve King's congressional district. And yet it is a widely-agreed-upon set of facts within the academic study of human intelligence. The debate is not whether racial intelligence differences exist, but why. Maybe it is genetics, or maybe the tests are biased in favor of Asians, or maybe it is Asians having a Confucian work ethic, or maybe the secret/implicit racism of whites everywhere keeps black achievement low, or maybe blacks are lazy due to their culture of victimhood, or something like that. Whatever the cause, the scores are what they are, and we have no room for doubt about them. Not only that, but we see the same hierarchy for the correlates of intelligence: educational attainment, income, and crime. You can claim that the causal direction goes the other way--you can claim that socioeconomic success causes greater intelligence--and that would not deny the reality that races differ in intelligence. Instead, that would admit that the racial intelligence differences exist and are meaningful. After things like SAT scores showing lower income Whites usually score higher on SAT scores than higher income Blacks, or the transracial adoption studies showing Asians scored higher in IQ than their White adoptive parents, and Blacks still scored lower in IQ than their White adoptive parents, with Mulattoes scoring intermediate. They will continue to blame things like poverty, which is clearly not the case with what I just wrote above. Many people are just dumb, and easily misled. BTW, these are the same kind of Liberal idiots, who if I told them dumb Polak jokes were prejudices against White Poles, Most of them would probably laugh at me. Many people are just dumb, and thoughtless brutes, indeed. Last edited by WitoldPilecki; 2019-02-09 at 11:03.